Adibashi Mini Museum, housed at the CARITAS regional office, is a treasure trove of antiques collected from different areas of the greater Mymensingh region over the last 20 years. Acclaimed director Tareque Masud’s latest movie ‘Runway’ has recently received an uncut certificate from the Bangladesh Film Censor Board. The movie, produced by Catherine Masud, is expected to be released across the country in November. Bangladeshi short film “The Professionals” has been selected to participate at three international film festivals — two in the USA and the other in the UK. “The Professionals” will be screened at Chicago South Asian Film Festival, USA; 25th Fort Lauderdale International Film Festival, USA and 18th Raindance Film Festival, UK. Actress Eva Longoria Parker has raised $568,440 in a celebrity Twitter auction for disabled children in Haiti. Parker spearheaded the auction on the social networking site. The 35-year-old offered to follow fans on Twitter and arrange one-of-a-kind meetings for the winning bidders who donated money throughout last week. 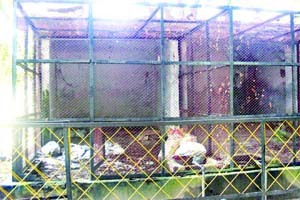 The Rajshahi Zoo is losing its attraction for the visitors, with 32, out of its 58 cages, remaining empty for long. The number of visitors to the zoo has decreased remarkably when it was once a popular recreational spot for the people in the north. Local people alleged that the zoo authorities do not provide enough food for the animals and that is why most of the animals are weak and suffering from various diseases. 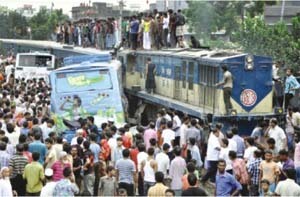 A commuter train ploughed through traffic at Sayedabad level crossing in the capital yesterday killing six people and injuring 25. Rab-3 sources said they found four bodies on the spot. Two people died at Dhaka Medical College Hospital. The government on Wednesday directed the authorities concerned to reclaim at least five canals in the capital from grabbers, who include political leaders, by October, 2010 to save the city from water-logging. An airhostess of Biman Bangladesh Airlines was arrested from Hazrat Shahjalal International Airport yesterday while trying to smuggle out foreign currency worth Tk 2.5 crore. High Court judge Salma Masud Chowdhury’s son Shafayat Ahmed was on Wednesday remanded in police custody for a day for interrogation in a case filed against him on charges of acid attack on one of his friends on August 5. A woman died and three fell ill inhaling poisonous gas after a cylinder exploded at an ice mill in Bagerhat town yesterday. New Zealand captain Daniel Vettori said on Wednesday that they singled out Shakib Al Hasan, the world’s number one all-rounder, as the main threat in next week’s five-match one-day series. Bangladesh on Wednesday announced to host its first professional golf tournament of Asian circuit, the Grameenphone Bangladesh Masters, in Dhaka from January 26-29, 2011. Micromax Informatics Limited, an Indian mobile phone company, has come to the rescue of the Bangladesh Cricket Board by agreeing to sponsor the upcoming five-match one-day day series between Bangladesh and New Zealand. The Bangladesh Olympic Association has decided to bid for the 2016 Asian Beach Games, The decision was made at an executive committee meeting of the BOA at the BOA House on Wednesday. Khulna and Chittagong won their respective matches of the 4th Women’s National Cricket League at the Sylhet Divisional Stadium yesterday. The matches were a welcome relief for organisers, after two full days were washed out due to rain.